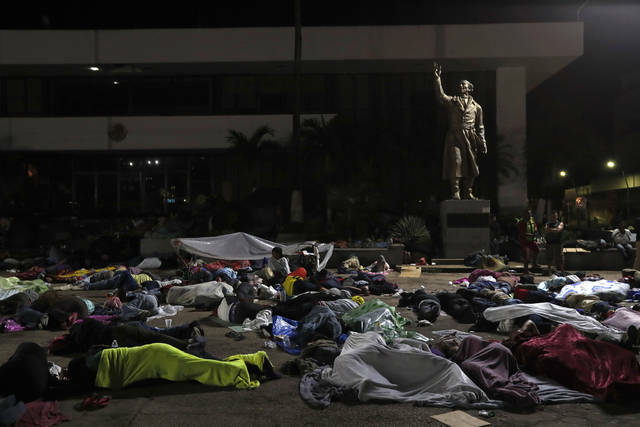 TAPACHULA, Mexico (AP) — Thousands of Central American migrants hoping to reach the U.S. were deciding Monday whether to rest in this southern Mexico town or resume their arduous walk through Mexico as President Donald Trump rained more threats on their governments. After blaming the Democrats for “weak laws” on immigration a few days earlier, Trump said via Twitter Monday: “Every time you see a Caravan, or people illegally coming, or attempting to come, into our Country illegally, think of and blame the Democrats for not giving us the votes to change our pathetic Immigration Laws!” He apparently sees the caravan as a winning issue for Republicans a little over two weeks ahead of midterm elections. A team of AP journalists traveling with the caravan for more than a week has spoken with Hondurans, Guatemalans and Salvadorans, but has not met any Middle Easterners of the sort Trump suggested were “mixed in” with the Central American migrants. José Anibal Rivera, 52, an unemployed security guard from San Pedro Sula crossed into Mexico by raft Sunday and walked up to Tapachula from Ciudad Hidalgo to join the caravan. “There are like 500 more people behind me,” he said. He vowed to reach the U.S. border, still nearly 2,000 road miles away at its closest point. “Anything that happens, even if they kill me, is better than going back to Honduras,” he said. Ana Luisa España, a clothes washer and ironer from Chiquimula, Guatemala, joined the caravan as she saw it pass through Guatemala. 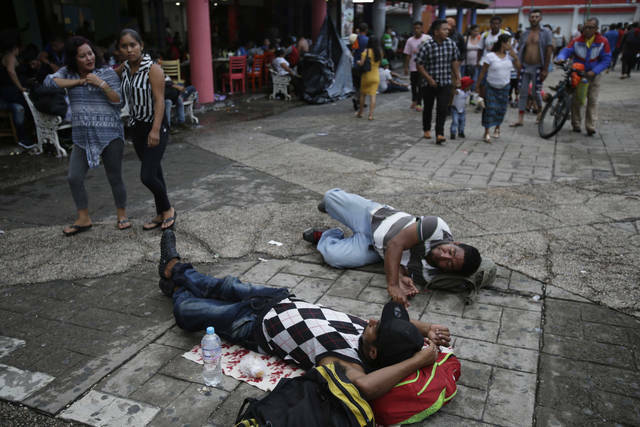 Isis Ramirez, 32, a mother of three from Tegucigalpa, Honduras, awoke Monday morning on a square of sodden cardboard in Tapachula’s town square, her swollen feet stretched out in front of her, wrapped in bandages applied by paramedics. Blisters had formed on her feet from the cheap plastic sandals she wears. Nearby, Julio Asturias, 27, a migrant from San Juan, El Salvador charged his cellphone from a dangling wire. “I want to return to Arizona, and when I heard that the caravan was passing, I joined it,” he said. He said he was deported a couple of months ago after police pulled him over for a burned-out tail light. 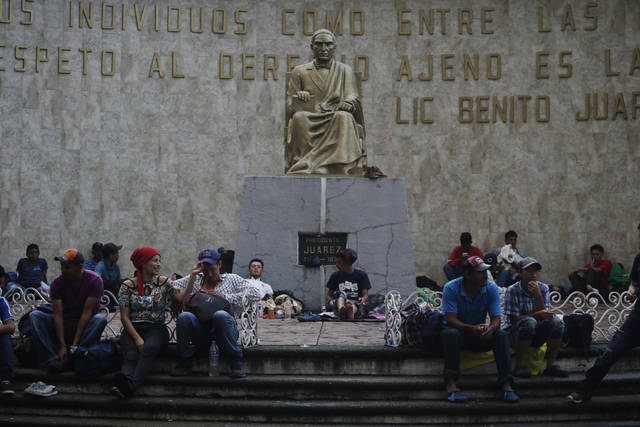 On Sunday thousands of migrants stretched out on rain-soaked sidewalks, benches and public plazas in Tapachula, worn down by another day’s march under a blazing sun. The migrant caravan, which started out more than a week ago with fewer than 200 participants, has drawn additional people along the way and it swelled to an estimated 5,000 Sunday after many migrants found ways to cross from Guatemala into southern Mexico as police blocked the official crossing point. AUSTIN, Texas (AP) — With Mike Pence and Donald Trump Jr. already visiting the state and the president himself coming Monday, Ted Cruz is convening a veritable parade of Republican powerbrokers in the final weeks of the Texas Senate campaign to ensure Democrat Beto O’Rourke doesn’t upset him. O’Rourke is countering with the opposite. He’s blowing off the Democratic Party’s political luminaries and instead cranking up the cool — rocking with Willie Nelson, securing shout-outs from star rappers and road-tripping with a 38-year-old Kennedy whose family name still has its mystique. While their approaches seem divergent, both candidates are opting to sacrifice one goal to accomplish another. They’re trying to fire up the loyalists they see as key to victory, even if it means slighting moderates and undecided voters — energizing the right and the left while ignoring the middle. “There’s a common misconception that elections are mostly decided by so-called ‘swing voters,’” O’Rourke’s campaign wrote in its “Plan to Win.” Cruz has for months noted that there are more Texas Republicans than Democrats, so if he guards against conservative complacency, he wins. “There are many of us who argue there is no middle and there are no swing voters left,” said Texas Democratic consultant Colin Strother. O’Rourke hasn’t completely written off non-Democratic voters, trumpeting bipartisanship at rallies. But he hasn’t softened a platform of universal health care, gun control, decriminalizing marijuana and offering a $10,000-per-child federal grant for pre-kindergarten. “Beto is saying, ‘Hey look, you’re all welcome here, but this is what I believe,’” Strother said. After spending months hitting rural corners of the state that other Democrats gave up on decades ago, O’Rourke is now largely sticking to reliably blue venues such as college campuses, a Willie Nelson concert in Austin, a Houston show featuring rapper Bun B, Texas-Mexico border concerts and rallies and a Dallas sunrise jog. “He’s representing everyone and not just a certain group of people,” said 18-year-old Anoosha Adtani, who joined a line of students snaking out the door when O’Rourke appeared at the University of Texas at San Antonio. Not on the schedule are ex-Vice President Joe Biden and former Secretary of State John Kerry, though they’ve pitched in on Democratic campaigns elsewhere. Liberal powerhouses like Sanders, Massachusetts Sen. Elizabeth Warren and Alexandria Ocasio-Cortez also haven’t stumped for O’Rourke. Instead, he’s brought in Massachusetts Rep. Joe Kennedy III, who is enough of a greenhorn nationally that Cruz has made fun of him, laughing about how Kennedy drove O’Rourke between events and saying, “It may be the first time in history anyone’s ever asked a Kennedy to drive.” That raised in peoples’ minds the deadly, 1969 car crash on Chappaquiddick Island involving Sen. Ted Kennedy, Joe’s great-uncle. With his party controlling the White House and Congress, Cruz now touts a Republican status quo he attempted to torch as a tea party firebrand. In addition to the Trump administration’s top brass, fellow Texan John Cornyn, the Senate’s No. 2 Republican, hosted a Washington fundraiser for Cruz despite their past policy clashes. Fox News host Sean Hannity and ex-Texas Gov. Rick Perry, now Trump’s secretary of energy, also campaigned for him this weekend. Still, George W. Bush lives in Dallas but isn’t hitting the trail on Cruz’s behalf, underscoring how he’d rather have Trump supporters than traditional, country-club Republicans. A three-term El Paso congressman, O’Rourke has stayed within striking distance despite his party not winning any of Texas’ nearly 30 statewide offices for almost 25 years. His crunch-time strategy is to mobilize 5.5 million people who “are very likely to vote for Beto if they vote, but who might not vote unless we contact them.” That means prioritizing those who moved to Texas from other states and often settled in urban areas, and millennials who are “the most diverse, most progressive generation in American history,” according to his playbook. Chairman James Dickey said the Republican Party of Texas has been similarly contacting new and past sympathetic voters for months, not just in the race’s final weeks. “We have a very clear process that has worked very well,” Dickey said. Texas added 1.6-plus million registered voters since 2014’s midterm elections, with young voters helping to power that surge. But Austin Republican analyst Derek Ryan noted that four years ago, only about 14 percent of the newly registered voters under 20 wound up casting ballots. O’Rourke, though, insists that courting youth is no fool’s errand.